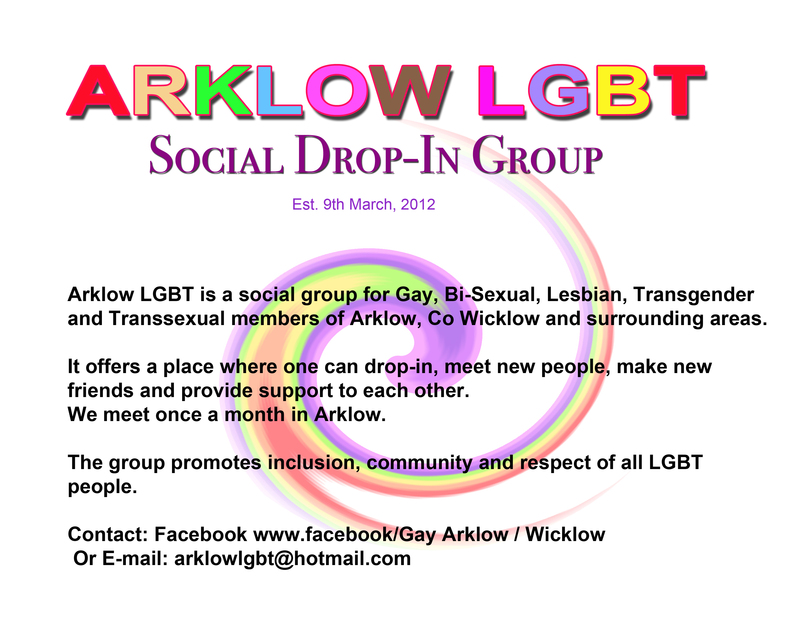 This page (and group) is for Gay, Bi-Sexual, Lesbian, Transgender and Transexual members of Arklow, Co Wicklow and surrounding areas. A social group where one can drop-in, meet new people, make new friends and provide support to each other. We meet once a month in Arklow. The group promotes inclusion, community and respect of all LGBT people. This page assists the group in communicating that message, and in informing members of the latest news and events relevant to the group. We encourage participation on our facebook page, and insist that everyone shows respect to all members. The page is monitored by Dave Thomas and Patrick Bracken. The Monthly gathering is open to all LGBT people in the Arklow and surrounding area. All friends, family etc., of LGBT people that wish to attend, are very welcome to meet with us AFTER the gathering, when we go for a drink in a local bar. The group is only open to people that identify as LGBT.